Inspiration comes from many different sources. A lovely walk will often do it, or a good movie, or poking around shops selling pretty things. One of my favourite things to get the creative juices flowing is to look through cook books. A good cookbook is a tantalizing blend of evocative images, enticing commentary, and unthreatening, clear instructions. They come in many flavours, cookbooks do. They run the gamut from CWL collections featuring Three Bean Salads to the highly technical tomes for professional chefs. Some are straightforward lists of ingredients and perfunctory instructions, while others seduce with photographs and inviting commentary. They can inspire you to let loose your inner cooking Diva, whether you are a closeted Paula Dean (butter), Martha Stewart (eggs), Rachel Ray (30 minute time limits), or Julia Child (old school cuisine, classical kitchen skills). One I revisit often is David Rocco’s ‘Dolce Vita’. Talk about seduction! If you have been to Italy and dream of going back, or long to visit for the first time, or feel that Italy is in your blood because Rome is Home for all us Catholics -- or you simply long for fresh produce and sunshine in these bleak winter months, this is the book for you. 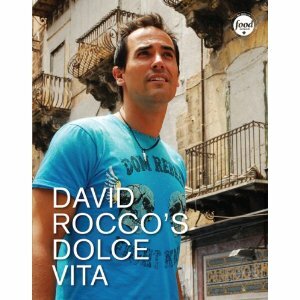 Dolce Vita does a better job of promoting Italy as a vacation destination than any travel guide I’ve read. It provides a glimpse into Italian life... confirming our belief that Italian life centres on fresh produce and sunshine. David’s recipes are redolent of family meals, full of references to grandparents, cousins, his wife. I like his relaxed approach to food. While he favours fresh and good quality, he acknowledges the reality most daily cooks deal with. There are no hard and fast rules, and he often makes suggestions for alternatives according to your own taste, which reminds me of my favourite Italian phrase: quanto basta, which means something along the lines of ‘just enough’ – or, as much as you like. "I'm not a chef, I'm Italian." I say this because my recipes are simple and fun. Cooking is one of life's pleasures. This isn't rocket science-just get in there and enjoy the process! If you're new, try the recipes as written. But, my best advice is go with your instinct, go with what you like. And don't worry about precise measurements. This next snack is something every Italian mamma makes for her own pleasure! Sprinkle a bit of sugar on a slice of bread. Drizzle with a drop or two of wine and enjoy! Or you can do as my grandmother did: dip the bread into a glass of wine, then sprinkle the wine-soaked bread with some sugar. Of course the recipe is accompanied by a picture of a gorgeous looking hunk of good bread prepared as he describes. How can a piece of bread be so evocative of a simple, satisfying way of life? Every time I pick up this book I long to stand on the sidewalk outside a cafe with a tiny cup of espresso in my hand. I want to walk the cobblestone street where he takes his nightly stroll with family and neighbours. I long to grow my own lemons. I can smell the sauce made of tomatoes plucked from his grandmother’s garden. Because Dolce Vita awakens my senses, my whole creative being is fed. I don’t always prepare a meal after returning the book to its spot on the shelf. I’ll sometimes be inspired to write, or pull out my never-ending crochet project. I think creativity works that way – one creative act fosters another.